Welcome to Lisbon; we will meet you at the airport and transfer you to the superior first- class Hotel Tivoli Lisboa (or similar) in the heart of Lisbon. * Relax this afternoon and evening or explore the city a bit on your own. This morning, we sail east along the Douro. You will see dramatic, sheer rock formations, picturesque terraced vineyards and graceful bridges and trestles along the way; you will also pass through two of the river’s locks at the Valeira and Pocinho Dams. We’ll arrive at Barca d’Alva, not far from the Spanish border, during lunchtime. Experience the renaissance of Lisbon, newly invigorated with trending galleries and restaurants. Explore two of Iberia’s oldest university towns: Coimbra, Portugal and Salamanca, Spain. Roam the port warehouses of Porto. Enjoy an evening of traditional cuisine, wine and fado singing. Cruise the Douro River Valley, the world’s oldest demarcated wine region and a UNESCO Site. 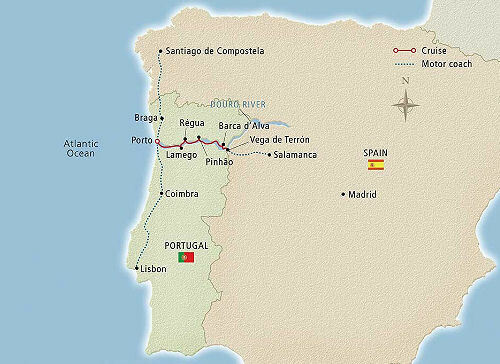 Our 10-day cruisetour includes a hotel stay in Lisbon and the added bonus of a visit to Spain.